Did you know that your neck can make you dizzy? Most patients don’t know that dizziness and neck pain can be connected, and many physicians miss this diagnosis. Why? Both patients and doctors think inner ear or brain when dizziness occurs. However, this symptom points to one very specific part of your neck. The uppermost part of the spinal column, called the cervical spine, consists of 7 vertebrae with cushioning discs in between each level and 2 joints at the back of each vertebra (14 total, called facet joints). Together with muscles, ligaments, tendons, and nerves, these structures in the cervical spine support and precisely control movement in our neck. 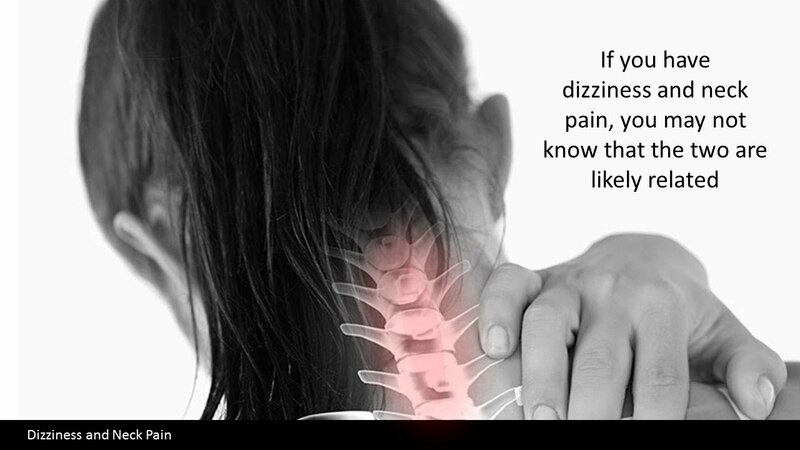 When we experience dizziness and neck pain, more often than not it’s from the upper neck (dashed box). There are actually three different systems that work closely together to keep us balanced. These are the upper neck, the eyes, and the inner ears. Via the nerves that come from the upper neck facet joints and muscles, the upper neck provides position-sense information that coordinates with our eyes and inner ear. The purpose is to assure that we have multiple systems that can keep us upright, walking, and level-headed, and, indeed, all of the input communications must properly sync and agree for you to maintain normal balance and for you to remain in control of your positioning, both physically and mentally. In other words, when these three systems don’t jive, even if it’s just one weak link with information coming in that doesn’t agree with the other two, dizziness can occur. In addition, the facet joints in this area of the cervical spine can refer pain to the head, which is why headaches can also be a common accompanying feature of dizziness and neck pain. Addressing the source of the upper-neck pain is the key to relieving the pain and eliminating dizziness. The goal is to avoid surgery, such as a cervical fusion that permanently disables neck movement and comes with many side effects and lengthy recovery times. There are many injuries and conditions that can cause neck pain, and effective nonsurgical treatments will depend on the issue. The simplest solution might simply be physical therapy; however, if this doesn’t relieve dizziness and neck pain, there are more treatment solutions that follow. Trigger-point dry-needling can be effective because oftentimes the bad input on balance is coming from muscle trigger points here. This involves inserting small acupuncture needles into tight or weak knots of muscle, which are caused by irritated nerves that supply the neck muscles. Trigger-point injections that involve injecting substances like local anesthetics and steroids can be myotoxic, or toxic to the muscle, and should be avoided. The facet joints in the upper neck can also become injured or arthritic. If you have a chronic headache along with neck pain and dizziness, a damaged facet joint could be the culprit, and these can usually be treated by injecting the upper-neck facet joints with platelet rich plasma (PRP). The ligaments in the upper neck can become stretched or damaged due to an injury or disease, and this can cause both the head and upper neck to have too much movement. This puts pressure on the nerves and causes neck pain, headaches, and dizziness. Tightening down these ligaments with a prolotherapy or PRP injection may help. If the damaged ligaments are causing a more severe craniocervical junction (CCJ) instability, this requires a more complex injection procedure. Anti-inflammatory steroids and radiofrequency ablation procedures are both common ways to treat neck pain due to facet joint and other injuries. Steroid injections are riddled with side effects, are toxic to stem cells, and can be less and less effective at eliminating pain with each treatment. A radiofrequency ablation (RFA) procedure uses a heated probe to burn away the nerves around the damaged facet joint. The thought is that by destroying the nerve this will stop the pain because the pain can no longer be transmitted to the brain. There is research to support RFA for chronic neck pain due to a damaged facet joint, but burning nerves creates some problems, including creating more damage in the joint since you can’t feel the pain (a Charcot joint), more-frequent and long-term treatments to address returning pain, and more severe pain when it does return. The upshot? Upper-neck problems are a common cause of dizziness. So if you have neck problems, headaches, and dizziness, make sure that an expert in nonsurgical neck treatment takes a close look! Have you had patients with base of skull pain and upper cervical pain...who also has evidence indicating an inner ear condition, notably Superior Semicircular Canal Dehiscence?? I have evidence of evidence of upper cervical instability and this condition. I suspect one is affecting the other or vice versa. No, but unless SSCD has been confirmed by a CT scan, then I would treat the neck first. I am a very successful Regenexx medial right knee stem cell patient. Your article regarding the neck causes me to wonder if the tinnitus I have is caused by neck issues. When I turn from left to right and rotate my neck the tinnitus gets louder and softer. The sound is 100% of the time. I have limited range of motion in my neck. Great to hear your knee is doing so well! Tinnitus can be caused by, and or aggravated by neck issues. It can also be caused by many different things, even hip replacement related cobalt poisoning. The change in volume upon turning your head and the limited range of motion in your neck suggest there's a good chance we can help. I have osteoarthritis in my neck. I get pain like pressure in my head. Dizziness and feel nausish by the end of the day. Makes me panic sometimes. I have osteoarthritis in my neck and occipital pain and spasms. I have vertigo when I look up or turn suddenly when my neck is tight. My ENT gave me Brant Danoff vertigo exercises which make my neck feel awful and my vertigo worse as I think it is cervicogenic more than ear ! Where are you located ?. I am in LOs Angeles. I hate this condition ! Hi, I feel some type of hard to explain dizziness that comes in fases, and many doctors cant explain it, but usually it gets better after some physiotherapy sessions. It feels like I’m a flag, although I feel no vertigo and experience no loss of balance. Is it possible that this is neck related? I also have a lot of neck stiffness and migraines. Yes, it's possible this is neck related. I have already had 3 cervical levels fused, c5-6,6-7, and 7-t1. Currently dealing with facet syndrome at the upper levels with pain, spasms, and dizziness. RFA pending. Will this procedure help all of my symptoms. The spasms and dizziness are getting very hard to deal with. Lightheadedness, balance problem, pain in the neck, and dizziness are all my problems. If all checks out with those tests, please contact us at 303 429 6448 to set up a Cervical Candidacy review. I have had dizziness and headaches for over 3 years. I woke up with dizziness in Oct 2015. Since that time, I’ve had every test you can name. I’ve also had surgeries that I was told would fix the 24/7 dizziness. I even had a craniotomy for a SSCD in June. I had a dehiscence, but it was not the root of my symptoms. I have a headache everyday along with the 24/7 dizziness. I’ve had a chiropractor recently tell me my atlas is subluxed anteriorly and rotated to the right. I am a PT and have done self treatments, including dry needling. I’ve had nerve blocks as well as so many med trials for migraine. NOTHING has helped me. Is Regenexx a reasonable treatment for someone like me? No one can figure out my diagnosis and I’m miserable. These issues are notoriously difficult to diagnose and get help for, which is why we're establishing the CCJ Instability Institute. Please see: https://www.regenexx.com/blog/a-case-study-of-severe-ccj-instability-and-our-picl-procedure/ https://www.regenexx.com/blog/candidacy-for-ccj-instability-procedure/ If you'd like to see if this issue is what's been causing your symptoms, and possible treatment, please submit the Candidate form here: www.regenexx.com, or give us a call at 755 622 7838. Please not that the PICL procedure (CCJ Instability Procedure) is only done at Regenexx HQ's in Colorado. I have dizziness 24/7. And muscle pain. Like my thighs hurt and they are restless. I’ve been to neurologist and ent. My ent test were good. I’m scheduled for mri. But no one seems to know what’s going on with me. I’m only 30 years old. All of these problems occurred after I was really sick in December. However, i was tested for Guilin barre or however u spell it and they said I don’t have that Bc I still have all my reflexes. I have constant neck pain that goes into the back of my head. No headaches tho. Any help or tips would be great. We'd need to examine you to advise. We have a Regenexx location relatively close to you that could do that. Here's their website: https://www.regenexx.com/sarasota/ or give us a call at 855 622 7838 for assistance. Sorry to hear how unwell you are feeling. We'd need to examine you to answer your question. If you'd like to set up an exam, please call 855 622 7838. I got a new gym programme about 3 weeks ago and it involved a lot of new workouts like pull ups and dumbbell rows all in circuits and a couple of days later I got dizzy spells with a pain in my traps on both sides and slight pain in my neck with dizziness, lightheaded and headaches in base of skull and naseau. My doctor says it is vertigo but I have been taking the stemitil tablets for the past week, I still have the dizziness and tight traps with headaches. Do you think it could be my neck? Hi there. I woke up dec 16 2018 with vertigo. It has been off and on ever since. I’ve not been able to work. I feel like clenching my jaw hard and forcing it through my head helps. Also trying to focus on words when typing even this, or reading makes my head spin. Sometimes headaches others not. Bp seems to bounce all over the place now . I wear a toque as the pressure on ears seems to help sometimes. I am light sensitive . I feel nauseous most of the time . Neck is tight . Ringing in ears . This is a debilitating horrible feeling . I feel like my life was just snatched from under me. Any thoughts on what might help . Do you have a connective tissue disorder like EDS? My ligaments on the left side of my neck stopped working, the right side is working normal. Left side is affecting left facial movements and causing me to flex those face muscles and clinch and grind breaking teeth. Back of my neck muscles have knots. I am light headed all the time but increases with more neck movement . It feels good to strech my jaw forward and right and left extremely .I cant consentrate or work .I have seen my heart doc, ent, neurologist and chiropractor with no answers or clue what's happening ,a dentist for a mouth guard 24 /7 to stop me from grinding and destroying more teeth. Chiropractic helps but temp. Now I am getting headaches also. Please tell me who I can see in Houston. I am 63 , felt great , did start testosterone for low- t about a yr. Ago. Was working out regularly , had more energy, felt great, then Bam ...January '19 it slowly started and took over. Can you advise me who to see here please??? For this particular issue Colorado; please submit the Candidate form here: centenoschultz.com, or give us a call at 303 429 6448. My question is what type of doctors should I see for treatment? I have been to ENTs who never seem to find anything wrong. Should I be looking at chiropractors, accupunturist, massage therapists? The plasma treatments you mention, who would administer those, I'm desperate.